Cool Wolf picks up the ladies & walks away a winner! 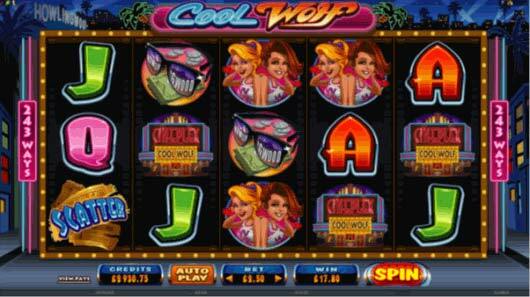 Cool Wolf is a 243 way to win pokies game themed on a super geek who transforms into a cool wolf to pick up the ladies. This game features colorful graphics and symbols include school girls, cool wolf himself, the geek, flashy cars and the cinema. This is a 5 reel game from Microgaming, the leader in online slots. The game pays out left to right and features a gamble function along with various high paying symbols, similar to Bitcoin pokie machines. The main bonus is the free spins mode which is triggered when 3, 4 or 5 of the movie ticket scatters land on any payline. You can win up to 25 free spins with the rolling reels feature enabled effectively doubling your winning potential. As with most Bitcoin pokies, the free spins bonus is a top way to get a big payout. You can also enable auto play with this pokies game allowing you to keep spinning the reels even when away from your PC or mobile.